The art of the Eastern Roman Empire and of its capital, Byzantium (Constantinople), found expression throughout the ancient world, particularly in Italian architecture. 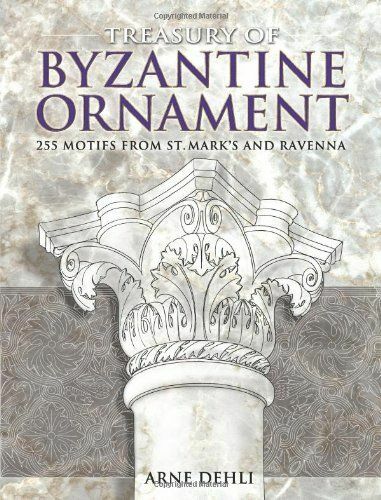 This superb archive of Byzantine ornament contains a wealth of decorative architectural elements derived from sixth- and seventh-century Italian buildings in Ravenna and in the Venetian church of St. Mark’s. Depicted in more than 250 delicate line drawings are splendid perforated marble panels, intricately fashioned stone grilles and cornices, lavish candle brackets, elaborate stone mosaics for floors and ceilings, bronze window guards, as well as an abundance of decorative wreaths, rosettes, mouldings, and medallions. A multipurpose reference for students, artists, and designers, this archive of sumptuous, royalty-free designs will also serve as a rich source of inspiration for anyone working in the fine or applied arts.